Bottle boy is in the bucket! 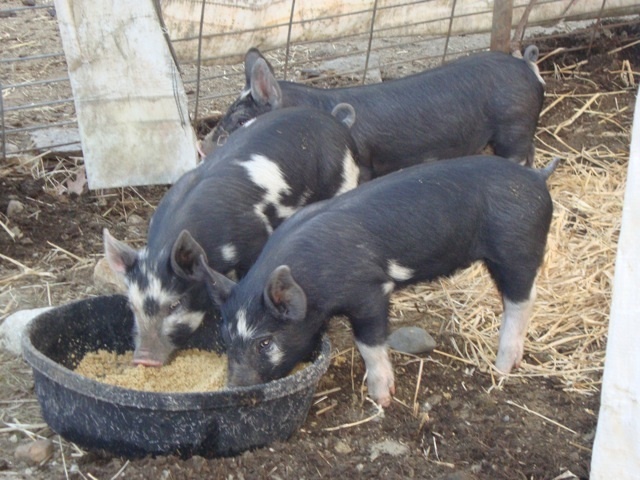 On another note, we have gotten this year’s piggies, and they are as cute as can be. 3 Berkshire crosses. It really is feeling like summer is right around the corner. 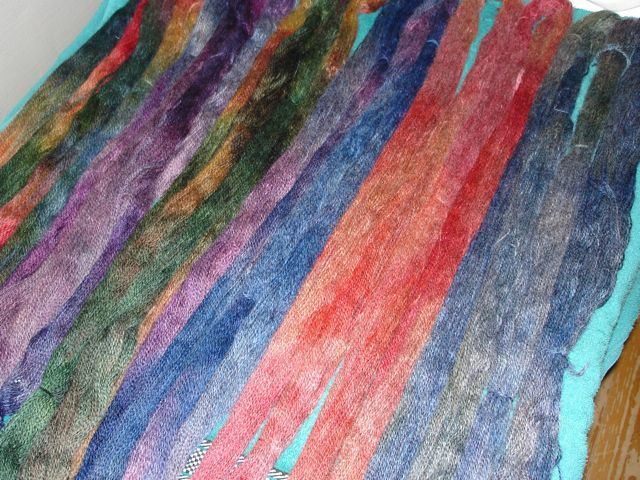 I broke out my dye box and got 12 skeins of wool dyed up. 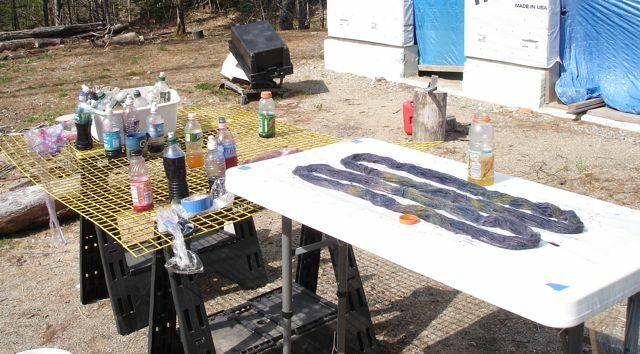 I always work outside as it’s a bit of a mess, but I had some fun. 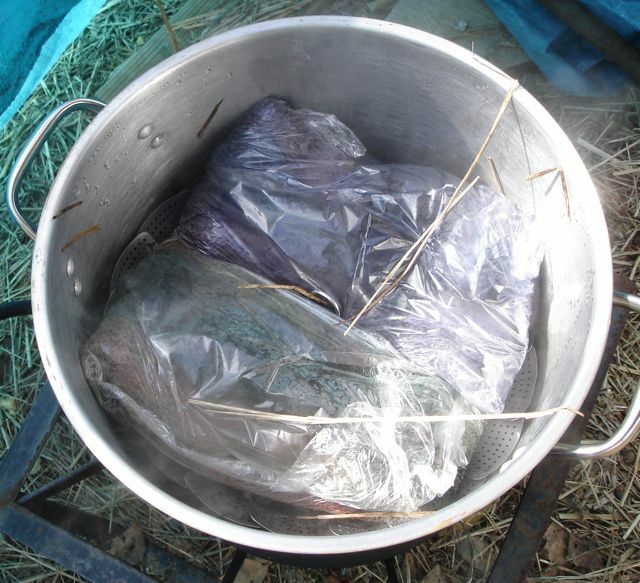 My only complaint is that the wind was gusting at about 12-15 mph and the saran wrap in which the skeins are wrapped, got incredibly tangled. Hardship! cooker, they sure are pretty! 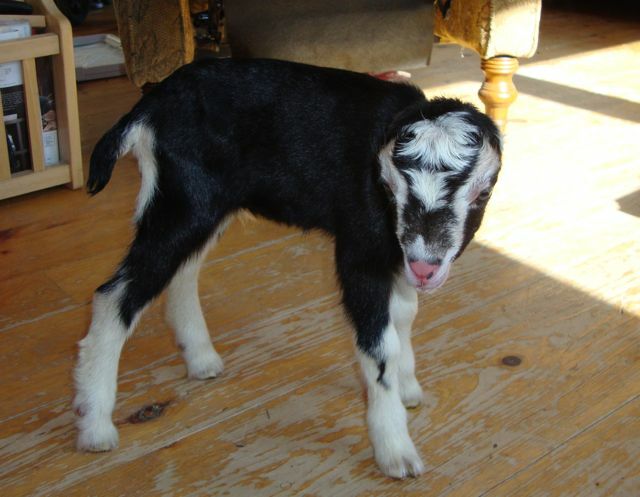 Does this look like a pampered goat? 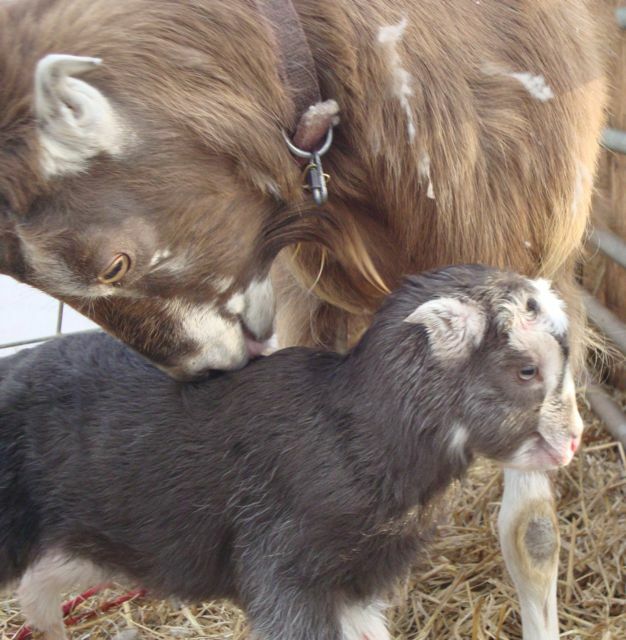 Elf waited to have her doeling until the day got a little warmer. It was kind of nasty early in the day with a cold wind and cloudy skies. When I drove down the driveway from work, I couldn’t see Elf at the fenceline where she usually is, but I got busy feeding little Banjo boy and getting changed, so I missed the birth of her 8lb 14 oz doeling! 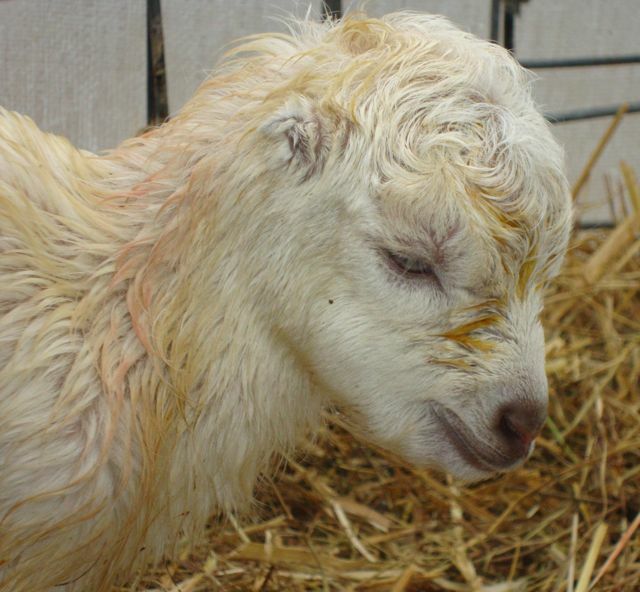 When I went out to do chores after 5, there she was, almost totally dry and bobbing and weaving at her mother’s udder. What a great sight! 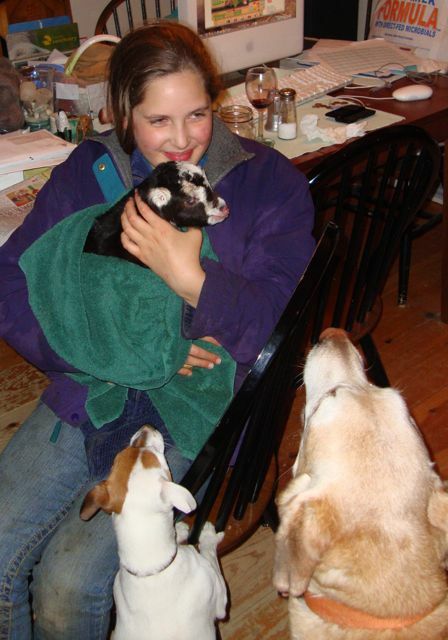 Elf had a doeling her first kidding, but since then has only had bucks. She doesn’t fit into our goat herd as well as the others, who are all related to Salsa, so I am totally thrilled to have a doe from her. Now they can be buds and hang together! Chloe, John and I didn’t even get our hands dirty on this one… we just weighed her, clipped and dipped her umbilical cord, gave her the BoSe shot, and watched her make herself at home at the milk bar. They should all be this easy! Friday we had some fun here that carried over into the weekend. 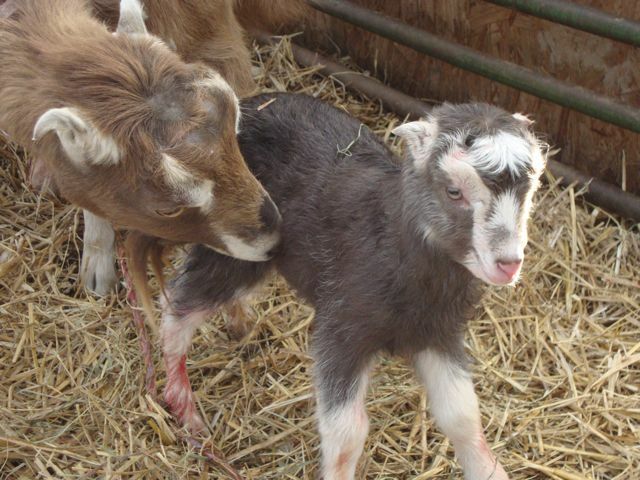 Oreo finally had her twins, and she did really well for a first-timer. 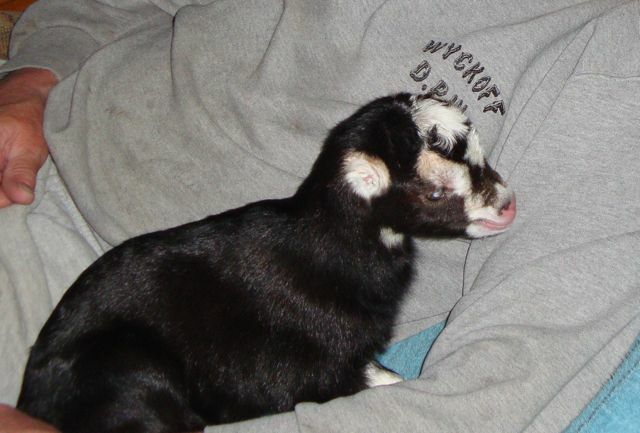 She had her buckling and doeling so close together, however, that she has only claimed the doe as her very own. So we have our little bucky boy in the house on the bottle. He has become one of the dog gang! 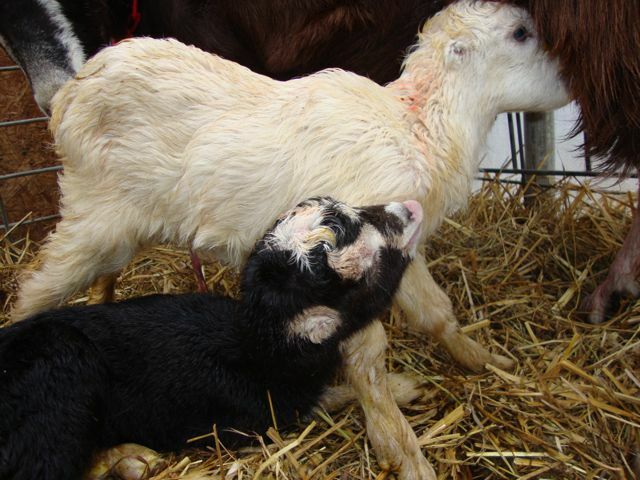 The little black one is the buckling. Chloe calls him Bela, and John can’t remember that name so he calls him Banjo. Either way, he’s cute as the dickens! It was summer all of a sudden today. I couldn’t believe how beautiful it was. 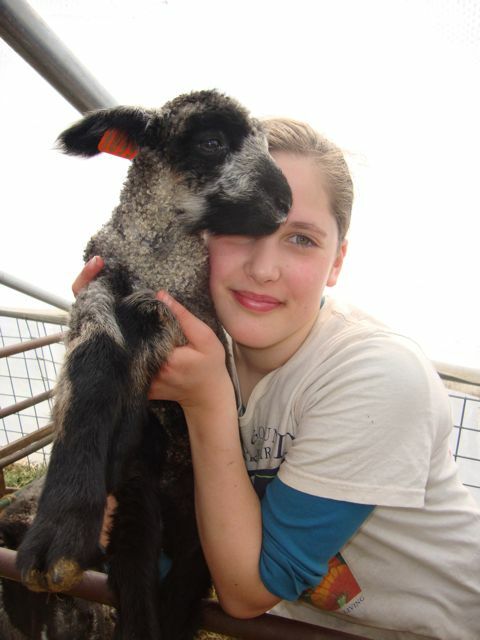 Chloe and I got into the greenhouse mid-morning and got to work on Fuzzy’s ewe lamb and Norma’s lambs. It was so warm already that the sheep were quite warm in there and we really needed to get eartags on the babies as well as banding their tails. So we took care of that and got some great pictures of Chloe with the babies. 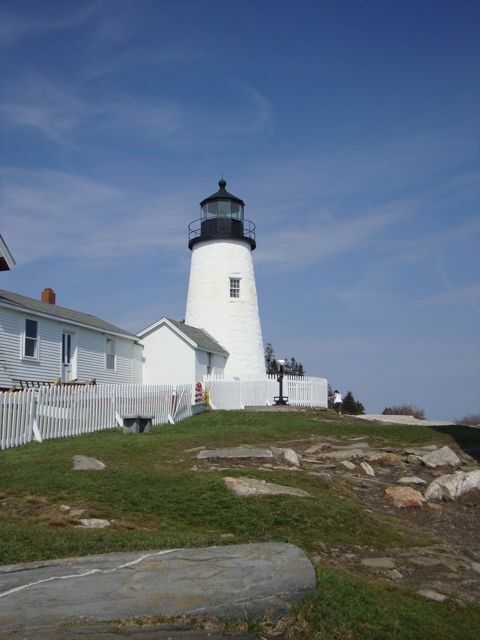 The day was so inviting that John and I decided to actually put on some decent clothes and head down to the Pemaquid Lighthouse at the bottom of our peninsula, about 10 miles down the road. It was spectacular! 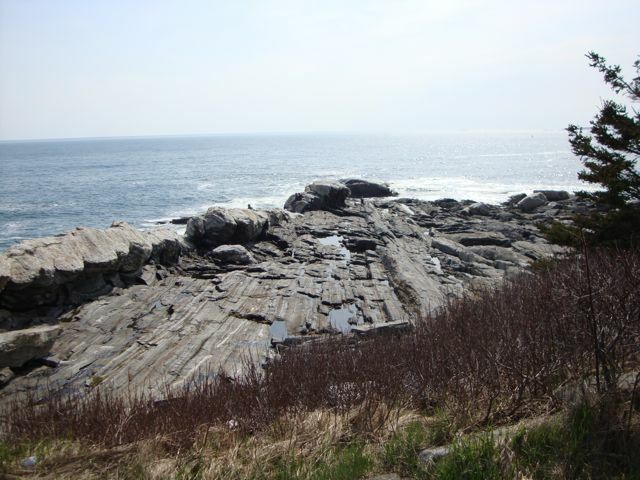 The tide was coming in and the waves were rough enough to make a good show on the rocks. It was a very restful and pleasant way to spend a few hours. We are lucky to live so close to such a beautiful spot. When we got home, it was back to work with the sheep. I even got to put on a pair of shorts today! Fuzzy’s turn today. She picked the nicest day of the year so far. John called me at work to say that she had a ewe lamb and was waiting for more. Fuzzy had triplets last year as a first-timer, so this year I guess she decided to take it easy. Her ewe lamb is gorgeous and very alert and lively. What a cutie! Chloe and Kali helped out while John babysat for our grandson and got her settled in with her new girl. When I got home I gave them a new, cleaner space, and tonight they are bedded down in the clean straw, taking it easy. 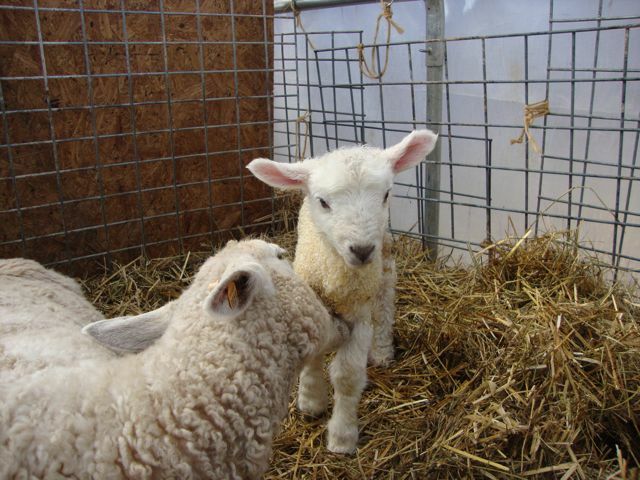 Fuzzy’s ewe is lamb #100 born on the farm, counting from the beginning. Wow! I never thought we would see that day. Wednesday night we spent the evening in the greenhouse with Norma. She is one of our older ewes, and even though she usually lambs with the greatest of ease, I was concerned because she was having contractions and pushing without evidence of a water bag being out. She really struggled. We knew she was probably having a big lamb, and we were right. 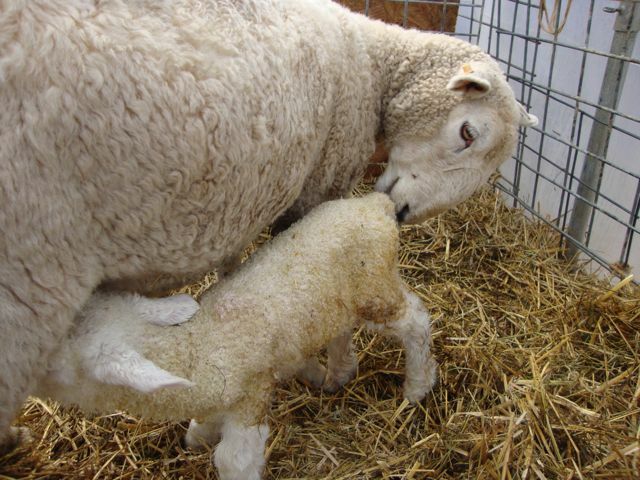 Her first ewe was 14 pounds! 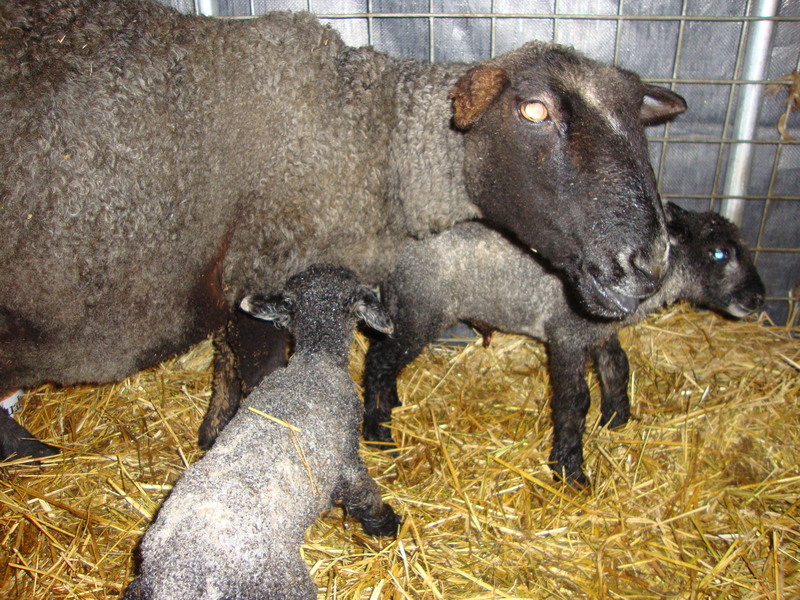 Number 2 ewe shot out without her even giving it any notice, with a more normal sized ewe at 9 lbs. Both blue with teardrops. Norma and the girls were doing fine when we got to bed around midnight. The next morning I could barely move (we are all getting colds again!) and when I checked on the new babies I was a little concerned. Their temperatures were not up to the usual 102.2, and the smaller of the two had a temp of only 100.8 (I checked because she was standing hunched over in the jug and putting my finger in her mouth she didn’t feel warm enough). Added to that, Norma didn’t seem to have a lot of milk. So we are treating her for a little bit of milk fever, and we did offer the lambs some milk replacer, but their temperatures are up to normal now and they are refusing the bottles. The bigger of the two has gained a pound and the smaller girl must have lost weight and regained. This morning she was exactly 9 pounds, her birthweight, and this evening she is 9 lbs. 6 oz. I am holding onto that thought! 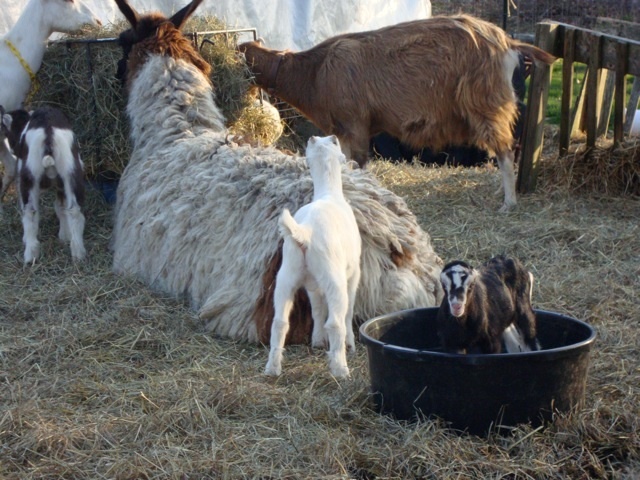 Norma is mothering them well, so I think it will be alright. I have a particularly sentimental feeling toward her. 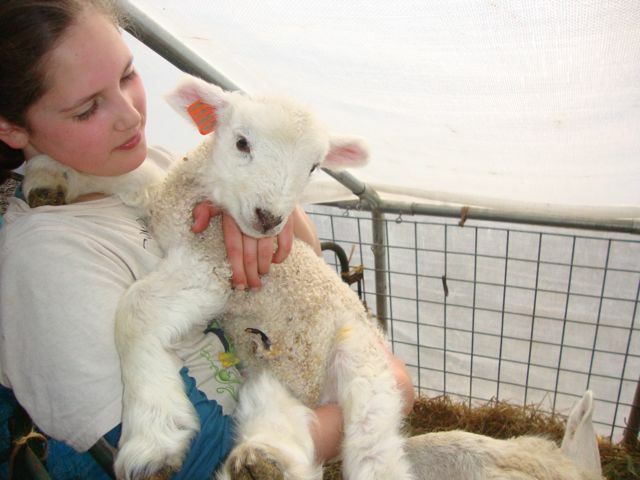 She is one of the first 3 lambs that we bought when we began our farm here in Maine. 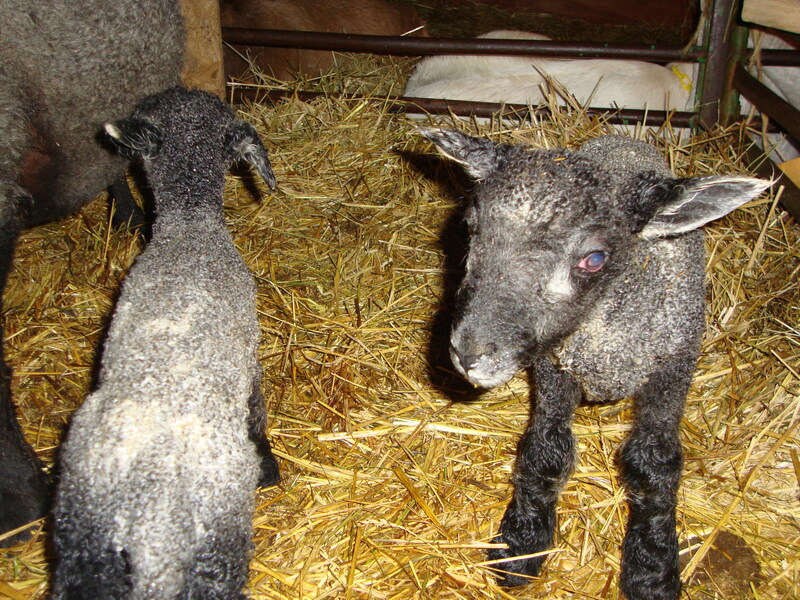 She has produced twins every year and only needed help lambing once. Never had a problem with anything else, just ate, produced beautiful fleeces, and made lambs. What a great ewe!